Short-term 4 month membership option available. Our gym is open 24 hours a day and with so many membership options available, we're sure there will be a membership that you'll love. Why not call our Membership Team today to get your tailored membership quote or to book a tour of our facilities? Currently you can join for just £30 which covers your first 30 days' worth of membership before going onto a 3-month minimum direct debit. Annual memberships are also available. No 12 month commitment. Pay £30 for 30 days and then just a minimum of 3 direct debit payments. Training is much easier when you workout with a friend. 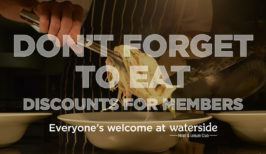 That's why when you refer a friend to join the Waterside, we reward you with a either £20 cheque or £50 to spend in our Coffee Shop and Restaurant. Please speak to the membership team for more details. 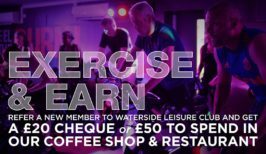 Refer a friend now by clicking this link or ask for a form from our memberships department to claim your offer. 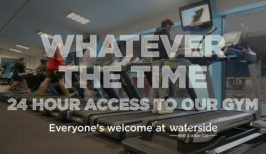 The Waterside is more than just a gym; with a Coffee Shop, Bar and Hotel attached, members can enjoy much more out of their Waterside membership ... starting with 25% discount in the Coffee Shop and Bar - simply show your wrist band at the counter to redeem this offer.